Stokstad and Bernstein contacted both the insurance company and the FBI, and the insurance company quickly agreed to pay the $5,000. But the Spencer people decided first to counter with an offer of $4,000—a stall with the aim of getting the FBI more time. In 1878, Jean Campinéanu traveled from his home in Bucharest, Romania, to Paris. While there, Campinéanu visited his uncle, Dr. Georges de Bellio. Dr. de Bellio was a homeopathic physician. He had left Romania nearly 30 years before, and had settled in Paris, where he worked at the Hahnemann Hospital, and became a member of the Société Médicale Homœpathique de France. Besides his work as a homeopath, de Bellio had one other pursuit that filled his time. One hundred and two years ago, on Saturday February 9, 1861, the fervent abolitionist Charles Robinson was sworn into office as Kansas' first state governor. As a long-time supporter of the Free-State cause in Kansas, Robinson was no stranger to adversity – or to skirting existing laws to achieve what he considered to be a higher moral purpose. During the Bleeding Kansas conflict, Robinson’s fellow "jayhawkers," and their proslavery opponents, engaged in the politics of violence that marked Kansas' entry into the Union and helped push the United States into the Civil War. As parking lots fill to capacity with frazzled shoppers during this holiday season, and lighted decorations appear in every corner, we may do well to remember that not so long ago Missouri and Kansas looked remarkably different, and Christmas provided an annual ray of hope for a nation torn apart during the Civil War. 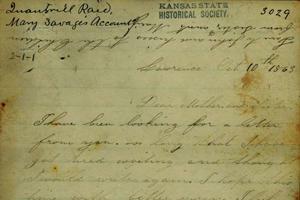 A massive, collaborative digitization project underway at the Kansas City Public Library has brought together a unique collection of documents from 25 institutions scattered across Kansas and Missouri. 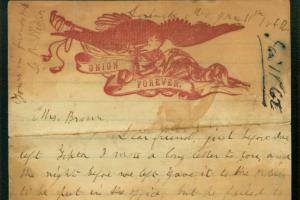 Among the 6,000 pages of digitized materials (which in early-2013 will be made available on civilwaronthewesternborder.org) are numerous letters written in the aftermath of William Clarke Quantrill’s infamous guerilla raid on Lawrence, Kansas in the early morning hours of Friday, August 21, 1863. In the Standifer interview, Dawson said that during the four years he was attending the Horner Institute he “didn’t tell one person in Kansas City” that he was attending the school. Like Roy Wilkins, Dawson lived at the YMCA. It would seem probable that this is how they met and started their friendship, which lasted for the rest of their lives. On June 12, 1925, the lives of three men came together in a way that challenged how things had always been in Kansas City. Find out how a teacher, a student, and a reporter swung a hammer at the strong wall of ethnic tradition in KC. William Levi Dawson was born in Anniston, Alabama, on September 26, 1899. 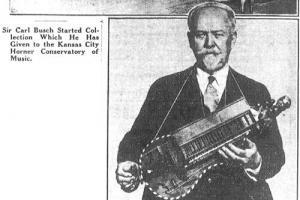 Dawson had a special kind of musical genius, and it helped him create a fault line in one of Kansas City’s historic barriers. Roy Wilkins was born August 30, 1901, in St. Louis. 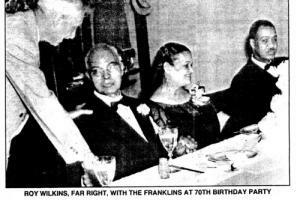 Had his father, William Wilkins, done what was expected of him, the birth probably would have taken place in Holly Springs, Mississippi. But he didn’t do what was expected of him. 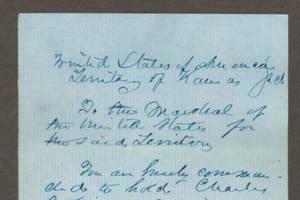 It happened on Friday, June 12, 1925. The lives of three men came together for an hour or so in a large room in a building in Kansas City. One of the men had reached his late 40s, and the other two were still in their mid 20s. The oldest was already well known for many accomplishments, but all still had major achievements ahead of them. 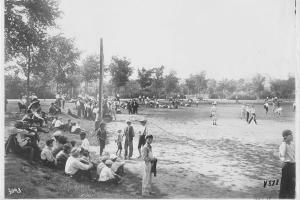 As All-Star fever rushes over Kansas City, the Library is presenting a rich look into KC’s 146-year baseball history in the exhibit Amateurs to All-Stars: The Rise of Baseball in Kansas City, open through the 2012 World Series at the Central Library. Before you head down to the Library, peek at a few photo highlights.